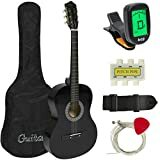 If you’re new to guitar one of the simplest, but important techniques you will need to know is how to properly fret the guitar. Fretting the guitar correctly will be the difference between a clean, full sound that requires minimal effort or a clunky, awkward one that strains your hand. If you’re not sure what fretting is or even what frets are. Don’t worry, it’s easy. First, we just need to go over a few basics. Frets are the steel things on the fretboard of your guitar. Each one creates a small box. The first box is called the first fret. The second box is the second fret and so on. You can also count the frets by the dots or ‘inlays’ on the guitar neck/in the fret box. Fretboard. Frets marked with red arrows. 1st fret box marked with orange square. play the guitar. We will get to that later! The ideal location to have your finger is just behind the fret. Near it, but not on it. This will give the least resistance and clearest sound. You don’t want to be on top of it or too far away from it. 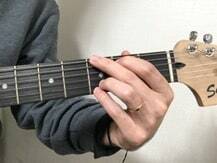 If you’re too far away from the fret it’s going to take a lot of extra effort and pressure to keep the string held down to get a clear sound, if you can do it at all. And if your too close or on top of the fret, it will almost always result in a dead sound. There will probably be no sound at all, just a ‘dink.’ You want to avoid being on top of the frets at all costs if you’re trying to play any sound or note. When you fret the guitar, you should put the tip of your finger on the string. Your hand should be relaxed, and your knuckles bent around the neck of the guitar. Your thumb should on the back of the neck, anchoring your hand. Now, you can practice playing individual notes on different frets and getting a clean and clear sound. And because you’re familiar with the names of the frets you will also be able to hear or read something like, ‘first finger, 7th fret,’ and know exactly where to go and what they’re talking about. These is common terminology when learning the guitar! Now that you know where to put your fingers on the fretboard to play individual notes, let’s take a look at something a little larger, where to keep the rest of your hand. This is important for many reasons. Think of hand position, essentially as tan anchor or foundation. Without a solid foundation you can’t have a solid structure, of course. Your hand is the only thing that connects you to the guitar. Having comfortable and correct hand posture will make it easier to play and give you the best sound. Improper hand posture will make it harder for you to fret notes correctly. Let’s take a look. There are two hand postures you generally want to avoid when playing any style of guitar. The first one is to avoid having your hand too flat. You don’t want your palm and thumb to be flat on the back of the neck. If your palm is flat against the neck, it will angle your fingers and make it more difficult to correctly fret the notes. It will also make it nearly impossible to put your fingers into the right position to fret a note. Here you can see the difference between correct hand posture and hand posture that is too flat. Notice that when your hand is too flat, your elbow has to come in closer to your body. Keeping your hand this way makes it harder to fully stretch your fingers as well. So playing some basic chords could be much harder if your fingers are straining to stretch out. If you play this way you will also probably feel a strain in your palm after a few minutes of playing. Lastly, you don’t want your wrist and hand too far under the guitar. A few minutes of this and you will see (or feel) exactly why. Keeping your hand too far under the neck means your wrist will be bent up at an extreme angle putting a lot of pressure on it. It’s extremely uncomfortable and doesn’t give you a solid foundation or base to fret notes. When you begin playing guitar, your fingers and hands could to go through periods of… well, pain. But don’t give up! It’s not that bad anyway, and playing guitar is definitely worth it. Learning correct posture and a comfortable way to play in the beginning will make it easier for you to learn and play along the way. 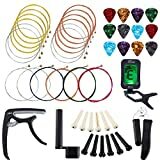 Most importantly, it will make your guitar playing sound better!